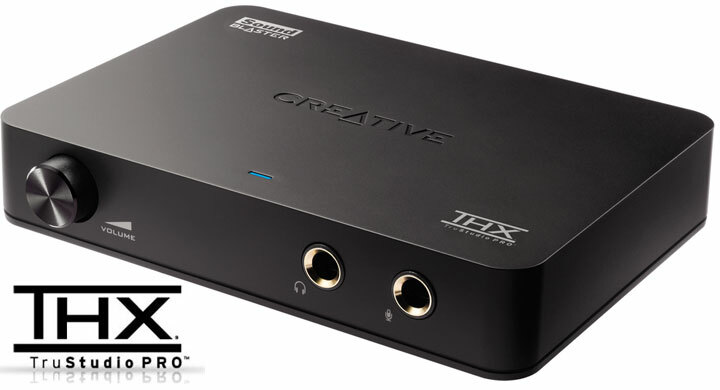 Creative, who has long been known as the #1 provider of consumer sound systems, has added another USB sound card to its lineup. The Sound Blaster X-Fi HD USB Sound Card is a slightly updated version of the previous X-Fi Surround 5.1 USB. This latest version improves only slightly on the previous incarnation in almost all aspects. It has very similar technical specifications for digital to analog conversion with all of the typical audio fidelity that Creative has been doing without fail since the early 90’s. The inclusion of the THX TruStudio Pro has benefited several of Creative’s recent creations, most notably their gaming headphones, and we’ve not “heard” of one that has reviewed poorly. The only game changer that has been somewhat shoehorned into this desktop sound card is the audio input and capture abilities. This unit seems designed to work into a vinyl friendly work studio. The front-facing headphone jacks are of the larger 1/4 inch variety found in broadcast booths and PA system everywhere. The reverse of the unit also sports specially suited RCA inputs for phonograph input. The enhanced software shipping with the X-Fi HD should make easy work of converting any remaining LP’s you have to FLAC, OGG or MP3. While this unit adds a few odd features it still carries all of the gaming and PC sound greatness you’d expect from a Sound Blaster but is retailing at the same price as the original X-Fi USB. That’s $99 before you decide if you need to purchase headphone or microphone adapters at about $2 each to work with the studio style plugs. Shipping now through Creative’s online store or Amazon.